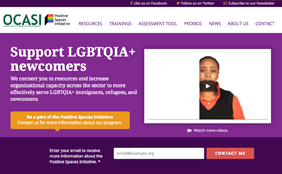 The Positive Spaces Initiative (PSI) aims to support the settlement sector to more effectively serve LGBTQ+ (lesbian, gay, bisexual, trans, two-spirit, queer, questioning, intersex, asexual, pansexual, genderqueer, etc.) newcomers. PSI encourages training, education, leadership and resource-sharing to support LGBTQ+ newcomers, staff, volunteers and community members. LGBTQ+ individuals are an integral, though often invisible, part of immigrant and refugee communities. Immigrant and refugee serving organizations have an obligation and responsibility to provide relevant, effective and appropriate services for these immigrants and refugees who are often marginalized within multiple communities. PSI has been traveling throughout the province of Ontario to deliver free workshops to staff members, from front-line workers to senior management and board members, on how to create welcoming spaces in their agencies that are inclusive and free from discrimination based on sexual orientation, gender identity, or gender expression.